The Queen of the Mississippi, seen here passing through the area last summer, will be at the Riverfront Park in Point Pleasant from now until Wednesday afternoon while repairs are being made to the ship. POINT PLEASANT — An unexpected visitor from the Ohio River has made its way to Point Pleasant. Denny Bellamy, Mason County tourism director, reported the Queen of the Mississippi was set to arrive and dock at the Riverfront Park Monday evening. Bellamy said he received a call early Monday learning of the ship’s unexpected stop by the city. He explained the crew reported to him damage was caused to the ship due to high water during its Ohio River Cruise. The Queen of the Mississippi is part of American Cruise Lines and was heading northbound on the Ohio River for its Ohio River Cruise. The cruise is an 11 day, 10 night trip on the Ohio and Mississippi Rivers. On its originally planned route the ship was due in Marietta, Ohio, Monday morning, but due to the damages caused from high water needed to make a stop in Point Pleasant Monday evening. The ship’s originally planned next stop was for Pittsburgh, Pennsylvania. Bellamy explained the ship is expected to head on its way from Riverfront Park upon its repair which is estimated to be Wednesday afternoon. Bellamy shared this is the Queen of the Mississippi first time to visit Point Pleasant. Two tours will be given to the passengers of the ship Tuesday, one being at 10 a.m. and the other at 2 p.m. Bellamy said each group will have approximately 200 people. He said on Tuesday evening one set of passengers will be leaving for Pittsburgh and another set of passengers will arrive in Point Pleasant to board the ship. The tour groups will be viewing the sights of the city such as the Riverfront Park, Tue-Endie-Wei State Park, Gunn Park, Point Pleasant River Museum, and the Mothman Museum. The tourists will also have an opportunity to visit shops on Main Street. Although residents of the city will not have to opportunity to board the Queen of the Mississippi during its visit, Bellamy commented it will be a perfect chance to view the ship up close, take memorable photos, and speak with the passengers about their trip. Bellamy commented while the Queen of the Mississippi is in Point Pleasant, not only will its passengers be shown care, but also the ship itself. Mason County Tourism will aid with needed UPS deliveries and assist passengers who may need transportation. The entire ship will also be re-stocked with water and all of the garbage will be disposed. Also, should any crew members or chefs need to visit stores for supplies, they will be taken where they need to go. The Queen of the Mississippi is expected to make its way through the area again in July. 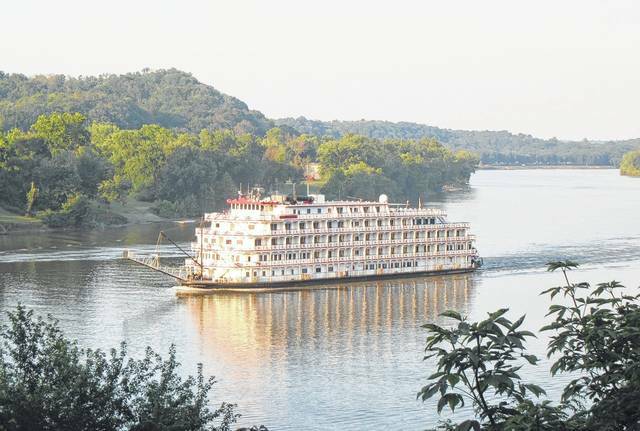 https://www.mydailysentinel.com/wp-content/uploads/sites/14/2018/06/web1_7.2-Queen.jpgThe Queen of the Mississippi, seen here passing through the area last summer, will be at the Riverfront Park in Point Pleasant from now until Wednesday afternoon while repairs are being made to the ship.